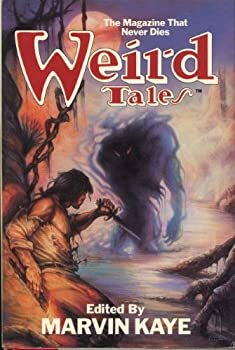 Marvin Kaye’s Weird Tales: The Magazine That Never Dies anthology from 1988 takes a slightly different tack than its earlier sister volume, Weird Tales: 32 Unearthed Terrors. Whereas the editors of that earlier collection chose to select one story from each year of the magazine’s celebrated 32-year run (1923-1954), Kaye has decided here to not just limit himself to the periodical’s classic era of 279 issues, but to also include tales from each of the four latter-day incarnations of “The Unique Magazine” (from 1973-87). The result is 45 pieces of generally superb speculative fantasy and horror, including six “Weird Tales Reprints” by such luminaries as Dickens, Poe, Flaubert and Stoker, as well as Otis Adelbert Kline’s “Why Weird Tales?,” an article that clearly delineated the magazine’s goals and intentions in its first anniversary issue, the one dated May/June/July 1924. Simply put, Kaye’s almost-600-page anthology is a collection of some of the very finest imaginative writing from the mid-19th to late 20th century. But even more fun than reading wonderful tales by old friends is discovering great authors one had never heard of before, or realizing that certain celebrities could actually spin a good horror tale. Who knew, for example, that Harry Houdini could tell a story as good as “The Hoax of the Spirit Lover,” or that 1940s horror producer Val Lewton could write a story as suspenseful and as meaningful as “The Bagheeta”? As for those new acquaintances that this reader made here, take Allison V. Harding, whose 1947 story “The Damp Man,” with its memorably dank and bloated villain, will most certainly make any reader hot to track down the tale’s two sequels. Rex Dolphin’s “Off the Map” tells the story of a lost English village far, far nastier than the Brigadoon it may bring to mind, while W. J. Stamper’s “Ti Michel” is a story of Haitian vengeance that builds to quite a hideous conclusion. No voodoo is involved here, but voodoo certainly does play a part in William Tenn’s “Mistress Sary,” a story about an 8-year-old albino girl who is all-too proficient in such dark arts. Other authors who I was happy to encounter for the first time here include Manly Banister, who provides a lovely story of a writer who is in love with a female werewolf, “Eena”; Hugh B. Cave, who gives us a chilling account of a writer who is in love with a female vampire, in “The Brotherhood of Blood”; Jack Snow, with his pulpy but highly enjoyable tale of a parasitic plant discovered in the African jungle, “Seed”; Dorothy Quick, with her sinister fantasy that revolves around a cute little puppy, “More Than Shadow”; and F. Marion Crawford, whose Gothic tale “The Dead Smile” will surely compel me to seek out more by this writer. An author who I first encountered in that earlier “Weird Tales” volume, C. Hall Thompson, is now a very solid two for two with me. The earlier anthology had given us Thompson’s brilliant Lovecraft pastiche “The Will of Claude Ashur,” while this latter one presents us with the author’s “The Pale Criminal,” a grisly neo-Gothic that really does make for a powerful read. Truth to tell, with all of the writers listed above, to read their representative story in this anthology is to become an instant fan. The book is not all “beer and skittles,” however, and there are a (very) few clinkers to be found. Ray Bradbury’s “Interim,” from 1947, did not leave much of an impact on me, and Tanith Lee‘s “The Sombrus Tower,” dark and mysterious as it is, was, for this reader, unsatisfying. Still, two clinkers out of 45 is not a bad ratio, and I have not even mentioned the marvelous works provided by William Hope Hodgson, H.G. Wells, Fredric Brown, Fritz Leiber, Jr., Gaston Leroux, Arthur Machen and many others. Indeed, for all lovers of fantasy and horror, Marvin Kaye’s Weird Tales anthology should prove a treasure trove of wonders.